Update: As of March 26th, 2013, this bill is now law. Updates below. Today the United States Senate announced a bill to fund the federal government for the remainder of 2013. This is the Senate's version of a bill that the House of Representatives passed last week. Like the House bill, the Senate extends funding for many agencies at 2012 levels; unlike the House bill, the Senate's bill contains specific language for funding all of NASA. "Good news" is not a phrase I have used often (ever?) 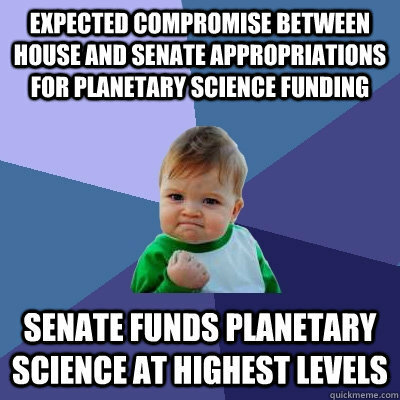 in my year of discussing the budget of NASA's Planetary Science Division. In fact, I can't quite bring myself to use it now. So I'm not saying this is good news – yet. Let's call it a positive development and we'll leave it at that for now. The real key to this bill – and why I'm cautiously excited – is that it contains specific funding directives for NASA's Planetary Science program. To quickly recap: last year, the Obama Administration released a proposed budget that drastically cut the Planetary Science Division at NASA, the program responsible for all robotic interplanetary exploration. It cut funding by $309 million (21%! ), which gutted the Mars program, slowed down the pace of smaller missions, and prevented any mission to Europa, the moon of Jupiter with a salty ocean. This is the worst funding crisis for the program in over thirty years. In today's Senate funding bill, they propose restoring $223 million to Planetary Science, reversing nearly all of the cuts. The Senate also specifies how the money will be allocated, boosting Discovery (small-missions), Mars exploration, outer planets, and scientific research. It also includes additional directives for $14.5 million for Plutonium-238 production (YES! --ed) and $75 million for "pre-formulation and/or formulation activities" for a mission to Europa. The numbers are universally good, though we're still not back to the magic $1.5 billion that we've advocated for here at The Planetary Society. Here are some of the specifics and how they relate to the proposed 2013 budget from the Obama Administration. You can see the full details on page 57 of this PDF. I just want to jump in here and say that these numbers are very good. Not perfect, but a lot further in the right direction than I expected. Last year, the Senate Appropriations committee restored only $100 million to Planetary Science, entirely to the Mars program. The House had added a lot more, though not enough to fully restore the budget. I expected that this bill would be a compromise between the two, but instead we get a level very similar to the House's proposal. If this bill is passed, it will send a strong message to the Office of Management and Budget (OMB) before it releases next year's 2014 budget. We've heard rumors that the cuts to Planetary Science were set to continue (due to the lack of Congressional direction on the issue). A real funding bill which restores the vast majority of cuts may send a strong-enough signal to the OMB to accept that Congress (and the people!) is committed to Planetary Science. It's very late in the 2014 budget process, though, so there is no guarantee that this will be the case. With increased funding to key programs, NASA can start to rebuild its Planetary Sciences program. An increased Discovery budget would surely mean an increased frequency of small missions, perhaps moving the next mission opportunity to 2014 (instead of 2015). 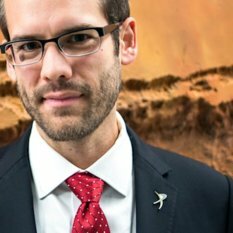 Increased funding to the Mars Exploration program would help kick start development of Mars 2020 and all-but-guarantee extended missions for our current slate of spacecraft on and around the Red Planet. It also brings us another step closer to a mission to Europa, though this is still very uncertain given the small investment here. I consider this enough to keep the embers alive on this mission until real funding becomes available. This bill does nothing to reverse Sequestration. NASA's Science Mission Directorate, which is the parent division of Planetary Science, will face a cut of 8.2%, but NASA is free to spread the total savings unequally between Earth Science, Heliophysics, Astrophysics, JWST, and Planetary Science. No one is quite sure about the details here. We face multiple hurdles before this bill becomes law. The Senate must vote to pass this bill. Since it differs from the House's funding bill, the House either needs to approve the Senate version or they must go into conference to produce a compromise bill. This all needs to happen within the next two weeks to avert a government shutdown. This is why I'm cautious. A lot can (and will) happen before we can truly celebrate. But remember, there is still a lot of work to be done here. Even if this total amount gets restored, it's really hitting the $1.5 billion level that will allow a real start to a Europa mission and more resources towards research (to support the scientific community) and increased frequency of mid-sized, New Frontiers missions. We also need to be ready to react to the Administration's 2014 budget, which will be released sometime in early April. If they insist on maintaining the cut, we will insist that Congress restore it, again. With the sequester assumptions in the bill (-5% for non-security accounts), I believe that NASA funding would be reduced by a further $876M, for a net total of $16.650B, which would represent a reduction of -$1.061B from the President's request. Just to emphasize, the above is referring to NASA's total budget. I do not know yet if the 1.877% cut applies evenly to all programs or if NASA has some flexibility with how it achieves that savings. If it does apply evenly, we're left with a $219 million restoration to Planetary Science before sequestration – still very good news. You can see more analysis about what this means for NASA and discussion of the "rescission" at Space Politics and Space Policy Online. The House just passed the Senate's continuing resolution bill which includes restored funding for Planetary Science at NASA. We now await the President's signature to make the bill law. See my first impressions here. The White House's website just moved this bill from the "pending legislation" section to the "signed legislation" column. No further news seems to be available, but the bill is now the law of the land, which means that NASA's Planetary Science division just averted the worst funding crisis in thirty years. Amazing. "To quickly recap: last year, the Obama Administration released a proposed budget ...This is the worst funding crisis for the program in over thirty years." And to think I voted for these %$#@. The lack of foresight on their (and my) part is very sad. Thanks for the up-dated information. Let us know how we can help as time(short-time) progresses. uh, changcho... That was kinda, sorta, BEFORE the last election that "the Obama Administration released a proposed budget cut ... the worst funding crisis for the program in over thirty years..." and we're supposed to be the rocket scientists? Unfortunately, my guess is you'll vote big government next time too though, right?